My beloved Figo died 10 december 2014, only 4 years old…. I can’t believe it is true! My heart broke that unlucky Wednesday when we were out in the woods and he misjudged (? probably) a jump over a deep ditch and he hurt himself really really bad…. 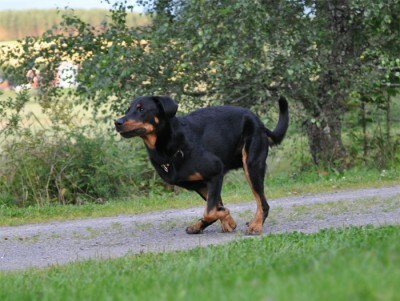 his right elbow was crushed and there was nothing more to do – Figo my beloved dog passed away calmly in my arms at my favorite veterinarian Magnus. I sat on the floor with Figo in my arms for a long time, I couldn’t let him go. I loved him deeply and I miss him incredibly. Sleep well my FigoPigo – the best dog I have ever had. He is missed by many – we had SO many things left to do, all the plans I had…. I missed Silo and I missed having a male around, I was hoping that Figo could take his place and he certainly did that! Figo was very alike Silo in a lot of things, with the difference that Figo was much MORE of everything. For good or bad but mostly good. Figo was a very happy dog who always wagged his tail and wanted to be around you. When he was indoors he liked to lay down really close to me – preferably in my lap! He was very cuddly and liked to be close. Figo was very fond of people and he liked to jump up and kiss them… he didn’t knock them over, just jumped and kissed. For such a large dog he was very agile and graceful, very much like his mother Axi. He loved to stay out in the yard and check that the neighbors ”behaved” and he checked who passed by down the road! He often lay on the top of my root cellar and scouted his domains. Figo was a dog with a lot of go! He wanted to work and tracking was what he loved most of all, except for just running, something most Beaucerons seem to like. I didn’t train as much obedience with him as I should have, but he liked everything we did because he wanted his rewards! Figo, as well as the other dogs in the litter, was very easy to reward; he loved play things and playing tug was his favorite game! Treats and food was also high up in his reward account. I did a little of almost everything with Figo; we entered an agility class and he LOVED it and was really good! Unfortunately my back makes it difficult for me to run, otherwise I think agility had been a perfect sport for Figo. We did some tracking and first he was in too much hurry but then he learned to keep a moderate speed and was very thorough. All obedience has been trained by operant conditioning and this was a concept he quickly bought, already as a puppy. Figo was a very attentive dog and he learned really fast, he was a lovely dog to work with! Figo was a dog that you do not need to boost, rather the opposite, but that was quite a nice ”problem”. I did some herding with Figo and he behaved very calm and collected, we had plans to do more herding in the future. We have competed in Rally obedience and been really successful, he entered Beginners Class 3 times and had 3 approved results and also the title RLD N. He has also entered Continuation Class and had 3 approved results there too and the title RLD F.
The plan was to compete in tracking in the future. I showed Figo fairly much and he did really well, when he was only 10.5 months he was BOB and 4:th in the group at Växjö International Show! 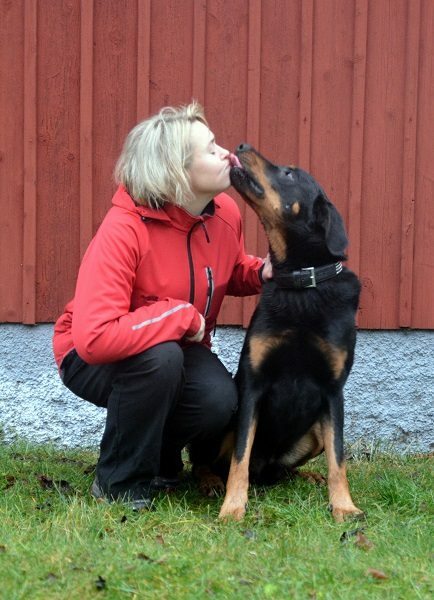 He was also BOS at the Swedish Beauceron Club Breed Special in 2012 & 2014. He became Danish show Champion 2014. I attend shows because I like it and my dogs like it and I want to display the Beauceron breed. Figo did his MH (mentality description) which he did really good, along with the rest of the litter! I am generally very pleased with the F litter. Figo was never ill, he tore a few claws during his first year but that is all. He was X-rayed with HD A/A and ED 0 – that means he had perfectly healthy joints! In late April 2014 Figo did his Mental Test ( MT / KORNING ) and he passes with 435poins and received the title KORAD.